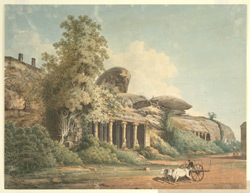 Watercolour of the Krishna Mandapa cave at Mahabalipuram in Tamil Nadu, by John Gantz, c. 1825. Inscribed: 'S E View of Krishna's Choutry Mahabalipoorum. J. Gantz'. John Gantz (1772-1853) and his son Justinian ran a lithographic press, but are remembered best for their watercolours of flat-top houses and public buildings in and around Chennai (Madras), dating to the first half of the 19th century. Mamallapuram, a tiny village south of Chennai (Madras), was a flourishing port of the Pallava dynasty from the 5th - 8th centuries. The site is famous for a group of temples, a series of rock-cut caves and monolithic sculptures that were most likely created in the 7th century reign of Narasimhavarman Mahamalla. The caves are all fronted with fine columns resting on seated lions, typical of the Pallava style. The Krishna Mandapa is a columned hall with a large sculpture panel carved on the wall inside the cave depicting the myth of Krishna lifting Mount Govaradhana to protect the villagers from the torrential rains caused by Indra.